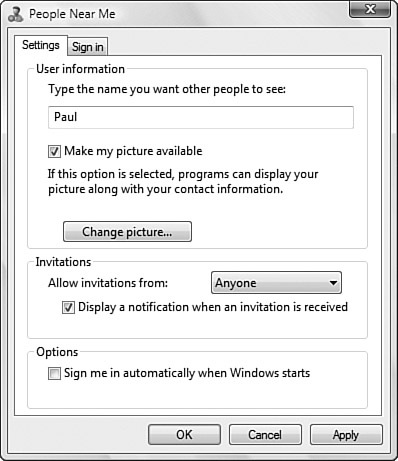 In previous versions of Windows, if you needed to remotely collaborate with other users by sharing a program or working together on a document, the tool of choice was Microsoft NetMeeting. Vista’s replacement for NetMeeting is an entirely new program: Windows Meeting Space. As in NetMeeting, you can use Windows Meeting Space to show a local program or document to any number of remote users and you can collaborate on a document with remote users. Windows Meeting Space uses several new Vista technologies, including Peer-to-Peer Networking, Distributed File System Replicator (DFSR), and People Near Me. The next few sections show you how Windows Meeting Space works. To use Windows Meeting Space, you must first sign in to People Near Me. You do this either by starting Windows Meeting Space or directly via the Control Panel: select Start, Control Panel, Network and Internet, People Near Me. In the People Near Me dialog box that appears, display the Sign In tab and activate the Sign In to People Near Me option. Before you click OK, you might want to look at the Settings tab, which enables you to change the name and picture that other people see, and to control various other People Near Me options, as shown in Figure 1. Figure 1. Use the Settings tab to configure People Near Me. When you’re signed in to People Near Me, you can launch Windows Meeting Space by selecting Start, All Programs, Windows Meeting Space. The first time you do this, the Windows Meeting Space Setup dialog box appears.  For Windows Meeting Space to work, the data must be allowed to pass through the Windows Firewall—to do that, there must be Windows Firewall exceptions for the Meeting Space Infrastructure and the DFSR. If you click Yes, Continue Setting Up Windows Meeting Space (and enter your UAC credentials), Vista creates the exceptions for you automatically. The Windows Meeting Space window appears, as shown in Figure 2. From there, you either start a new collaboration meeting or join an existing meeting, as described in the next couple of sections. Figure 2. 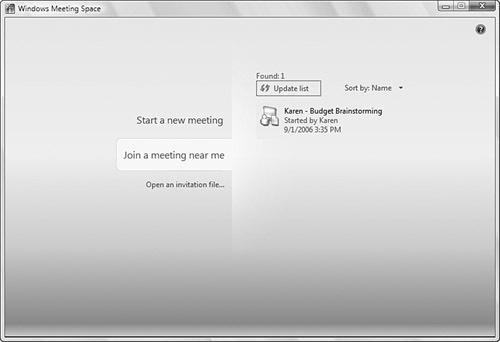 Use the Windows Meeting Space window to start and join collaboration meetings. In the Windows Meeting Space window, click Join a Meeting Near Me. 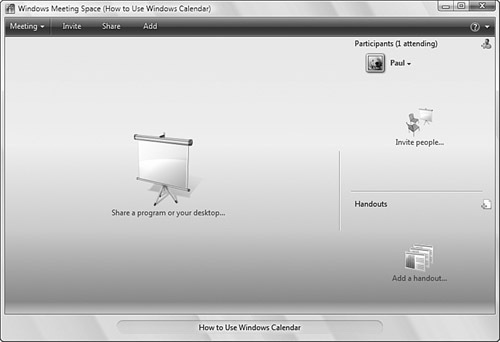 Windows Meeting Space displays a list of running meetings (see Figure 2). Click the meeting you want to join. Windows Meeting Space prompts you to enter the meeting password. Type the password and press Enter. Windows Meeting Space verifies your password and then joins the meeting. Click Start a New Meeting. Press Enter. Meeting Space starts the new meeting, as shown in Figure 3. Figure 3. A new meeting, ready to begin.